"A CRY FOR THE TIGER"
Despite millions of dollars spent on tiger conservation over the last four decades, tiger numbers continue to plummet. Less than 3,200 tigers remain in the wild, down from 100,000 a century ago; during that time, three of the nine tiger subspecies went extinct (the Bali, Caspian and Java tiger). The remaining six are endangered, but the South China tiger has not been spotted since 1983 and the Sumatran tiger hangs on the brink. Tigers now live in small, isolated pockets. Skyrocketing human populations in Asia have eliminated 93 percent of tiger’s historic range during the 20th century, with human settlements, roads, industry and agriculture encroaching on tiger territory, sparking growing human-wildlife conflict. When tigers wander into villages, take down livestock—or kill people, they often end up dead, shot or poisoned. Hunting has depleted tiger prey, often forcing the cats to go after livestock to survive. Poachers also target tigers: In the early 1990s, the demand for tiger parts for use in traditional Chinese medicine grew exponentially, fueling an illicit, multimillion dollar trade run by international arms and drug dealers. Skins are also prized, fetching up to $20,000 on the black market. Last year in Sumatra, a beloved tiger was poached out of the zoo. The situation has grown so dire that Thailand, India, and other nations have dispatched armed commandos to protect tiger reserves. I shot this story in three countries, Thailand, Indonesia (Sumatra) and India, trying to document the beauty of the tiger, the serious threats they face, and heroic efforts to protect them. 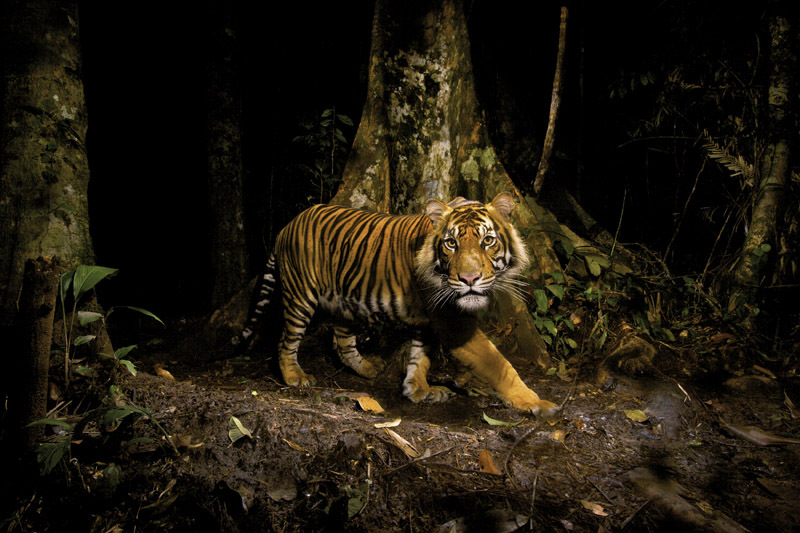 A tiger peers at a camera trap it triggered while hunting in the early morning in the forests of northern Sumatra, Indonesia. Trying to photograph the critically endangered Sumatran tiger is difficult: not only do few remain, but those that do mostly live in rugged mountains. Information on where to set the camera came from a former tiger hunter who is now employed as a park ranger. Sumatran tigers may very well be the next tiger subspecies to go extinct.